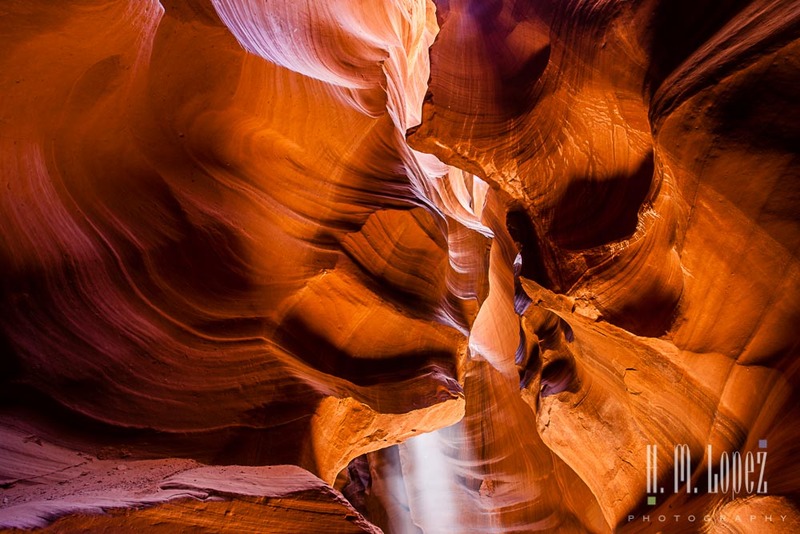 We did a limited amount of advance research prior to our Antelope Canyon Tour. And we found that there are a lot of details that are important in order to find the tour that is best suited for each person. There are also some important things to know in advance to best capture photographs of these places. 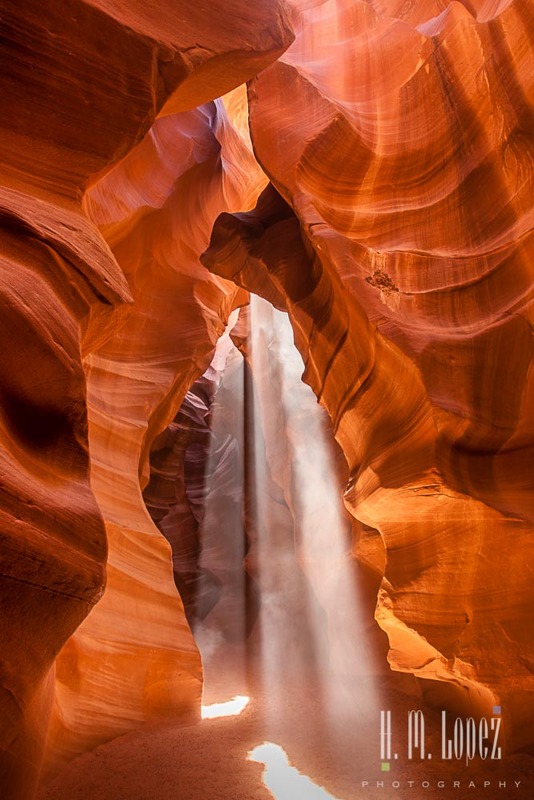 So here are some tips for Tours of Antelope Canyon. The Upper Canyon Tours are the most popular and get the most crowded. March through October is the peak season and November through February is considered off-season. 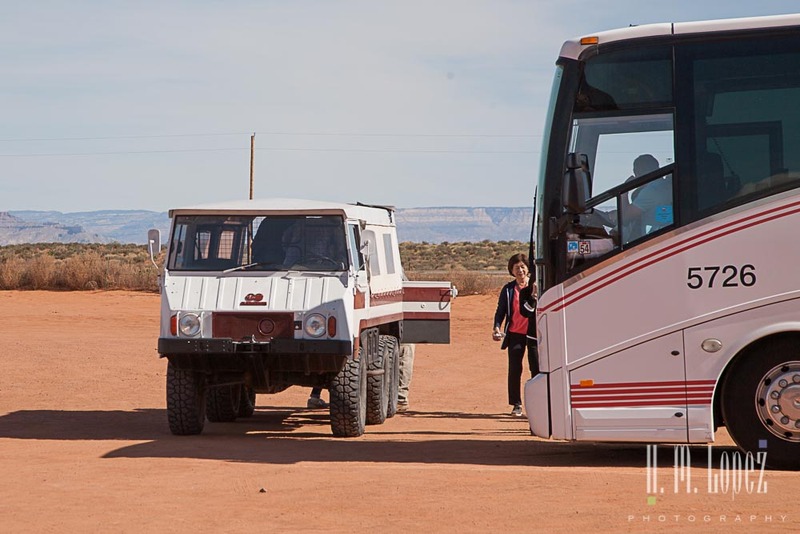 Guided tours are offered by several Navajo-owned tour operators. Each offers some version of sightseeing tour multiple times a day. These tours spend about one hour in the canyon. The most popular time of year is summer, followed by spring. 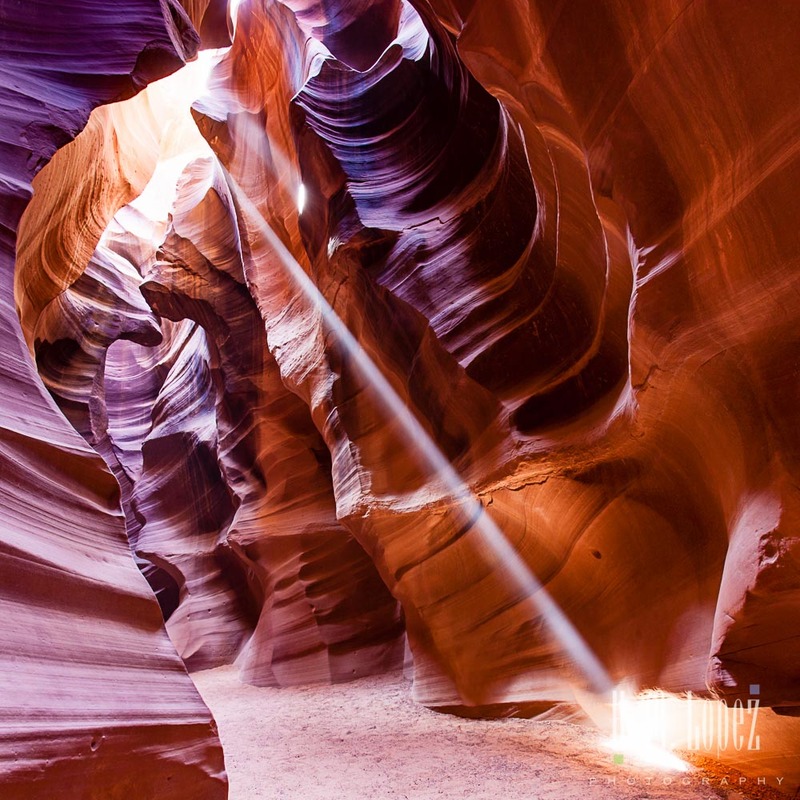 This time of year is when the famous light shafts shine into the canyon. The light shafts appear mid day, when the sun reaches its highest point in the sky. That is also when the canyon has the most light. And also the time when the tours fill up the quickest and the canyon is the most crowded. You may want to consider other times of day and/or times of year that may be less crowded, but may have dimmer lighting with no light shafts. We understand that these times bring out the deeper blue/purple hues that you find in the darker sections. Each tour company runs a photographers’ tour starting between 10:15-11:30 to catch the best time of the day. These tours require each person to have their own SLR camera and a tripod. It is not necessary to be a professional photographer but they do insist on proper equipment. 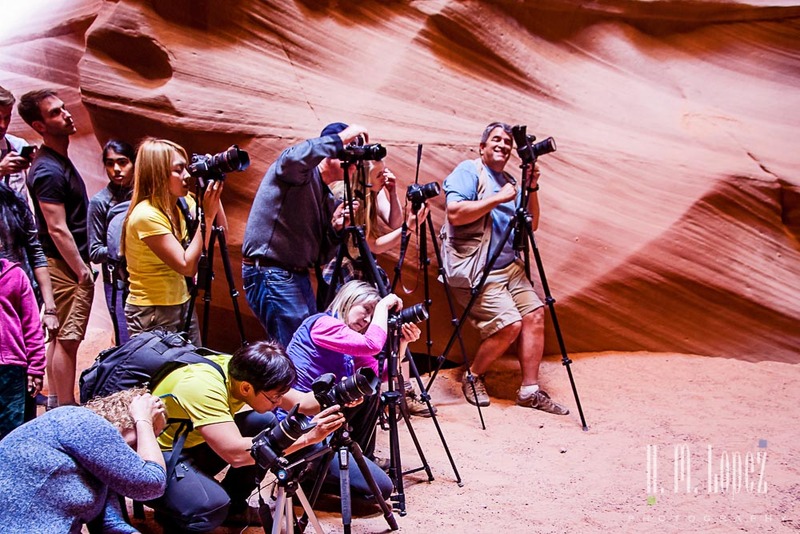 The photographers’ tours stay between 11/2 and 2 hours in the canyon, and their guides take the groups to the most photogenic spots, while they block traffic in both directions to give the group a very few (2 or so) minutes to get clear shots. It is a bit frantic and all the photographers are shoulder to shoulder, but it works really quite well. 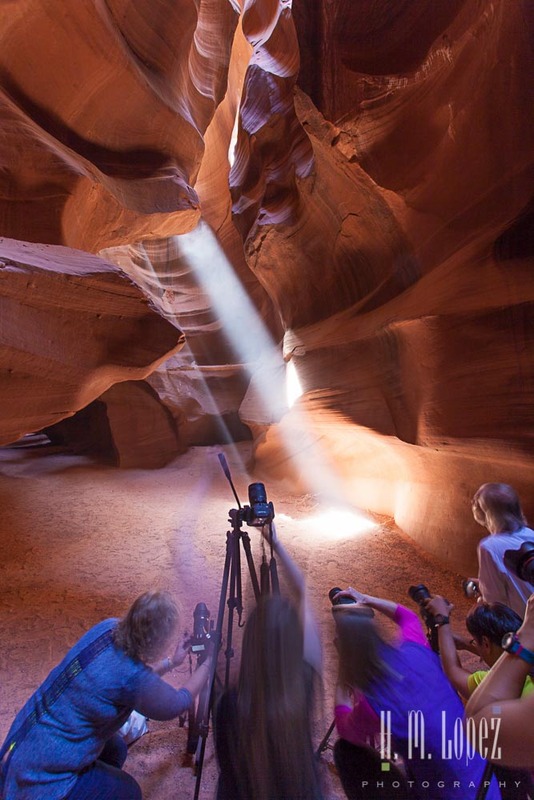 Photographers that plan to show their images on social media or sell should request a permit ($50) in advance from the Navajo Nation Parks and Recreation. As we found out, it is possible to get a permit from one day to the next but this practice is frowned upon. All tours include transportation to the entrance to the canyon via 4WD vehicles, approximately 15-20 minutes each way on a soft sandy wash. The guides each take their groups into the canyon, total distance walking in the canyon is maybe a third of mile. Many of the tours do not allow backpacks or bags, in fact, I recommend to travel as light as possible since there are many narrow areas in the canyon. Tours may be booked online in advance. If you are able to reserve one of the peak tours in advance, keep in mind that if it is a cloudy day, there may not be a light shaft. Also, during monsoon season (summer), on very rare occasions, access to the canyon may be closed due to possible flooding. These are tour operators that run tours with links to their websites. Prices and times may vary so be sure to read each website carefully. 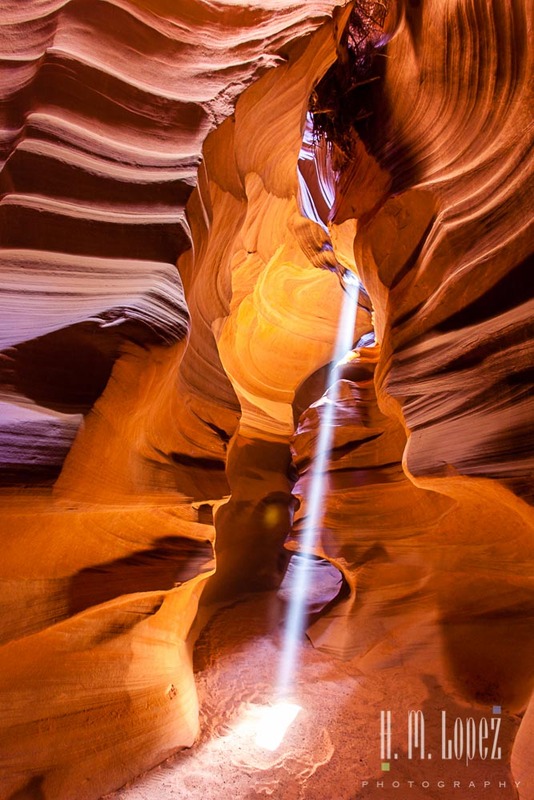 Adventurous Antelope Canyon Photo Tours was our tour operator. They call all of their tours photo tours since photos are allowed, only one of the tours is a photographers’ tour and allows tripods. If you are unable to book in advance, we suggest going to each operator personally when you arrive in the area. 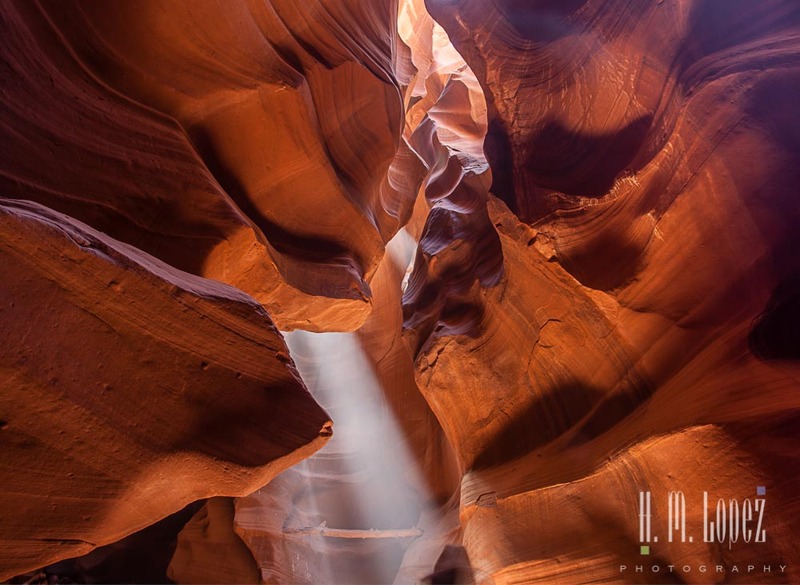 We found space on Adventurous Antelope Canyon Photo Tours by visiting them the week we arrived. Lower Canyon tours are first come first served and do not allow reservations. They claim to be less crowded and the canyon is just as beautiful, but without the light shafts. This area of the canyon requires a bit more walking and climbing a couple of ladders. For a bit more detail and some lovely photos of the Lower Canyon Tour, check out this post on The Lowe’s RV Adventures blog. 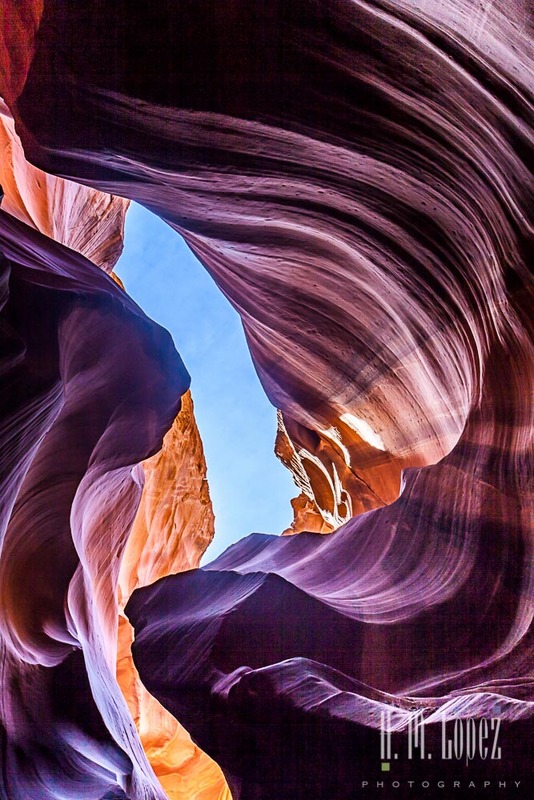 Like the Upper Canyon, tour operators offer both hiking tours throughout the day and more limited time slots for the photographers’ tours, which also requite a tripod and an SLR. 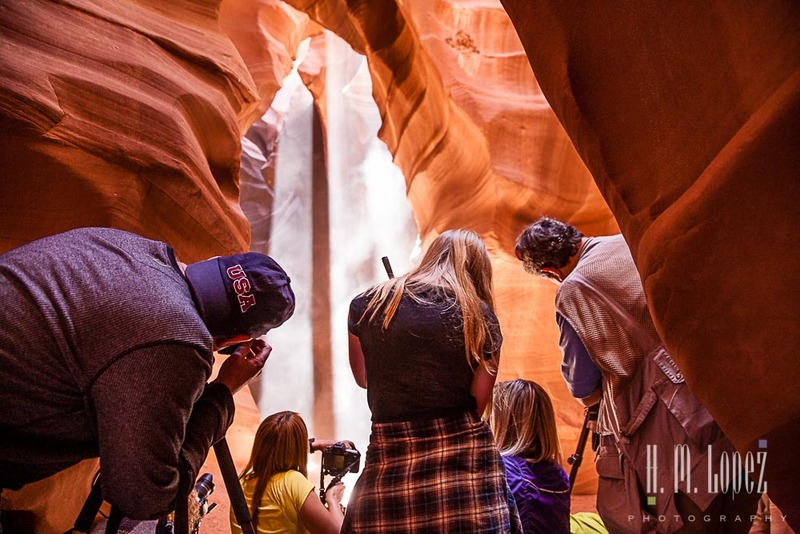 These photographers’ tours spend more time in the canyon as well. These two companies offer tours to the Lower Canyon. There are other canyons in the area to explore, and some of those tours are offered by these same operators. There are also boat tours of the lowest part of the canyon where the canyon meets Lake Powell. Read our post about our boat tour here. As you can see from the photos it really is an amazing place. But the setting can be challenging. The canyon is full of people with guides herding their guests along. There are deep shadows and really bright spots that require some care to capture properly. Some point and shoot and phone cameras these days have really good low light capability and since monopods/tripods are prohibited on all but the photographers’ tours these may be a good choice. And be sure to start with a fully charged battery and an empty memory card in your camera! We always carry backups as well. It is important that you really understand how to operate your camera and tripod as the situation in the canyon is pretty fast paced and crowded. This is not a good time to be figuring out what to do. Even though the guides are usually very skilled and willing to offer advice on the best settings for a given scene. Here are a few more technical thoughts on shooting in the canyon if you are shooting with an SLR or other camera with adjustable settings. I also added specific exposure info in some of the photo captions. Aperture / Depth of field Since the light tends to be mostly dim, automatic camera settings will tend to shoot with a wide open aperture. But this will result in limited depth of field. So if you want your photos to be in focus throughout your frame try shooting with an aperture around F11 or so. 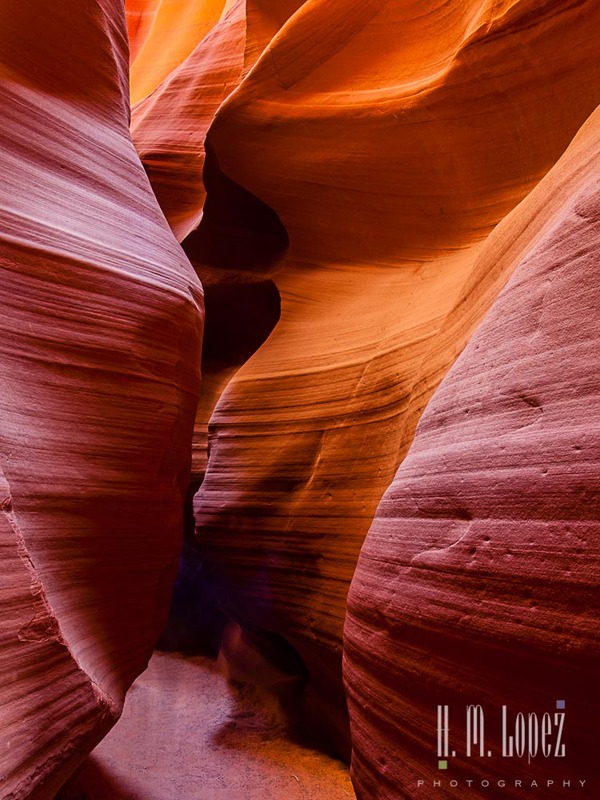 You will get the sharpest images with more of the canyon curves in focus. Shutter Speed But with an aperture in the f8 – f14 range, be mindful of your shutter speed. You may need to increase your camera ISO somewhat to make sure that you have a fast enough shutter speed for hand held photography, something say faster than 1/30th of a second. And remember to very gently squeeze the shutter release to avoid any camera shake. It may be possible to lean against the canyon wall to steady yourself. Of course if you are on a tour where you can use a tripod you have the luxury of shooting F11 at low ISO and a slower shutter speed for the very best exposure. White balance The red of the canyon walls can play games with your white balance set to “auto”. Best would be to shoot in RAW format so you can correct it in post processing, Otherwise, I would suggest setting your camera white balance to “cloudy” for best results. Exposure bracketing. Many scenes will include both very bright and very dark areas that are hard to capture. If you are able to bracket your exposures you can later choose the best one or better yet blend the images using HDR software to get the best results. Most of the images here are HDR blends of three bracketed exposures (1 stop) to balance the bright and dark areas. Take the widest angle lens you have. It is close quarters and the canyon walls are high. I shot mostly at 17mm. Dust! Dust flies everywhere and is bad for camera gear but it is very hard to avoid, be aware and wipe your gear down afterwards. But it can also ruin your pictures as it will quickly accumulate on your lens. Be sure to have a lens cloth and blower brush to gently clean the dust off your lens every few minutes. Look UP Some of the wildest shapes are above you. It also has the bonus of being one way to get pictures without people everywhere. We hope this helps. If you have any questions about any of this don’t hesitate to reach out and ask. 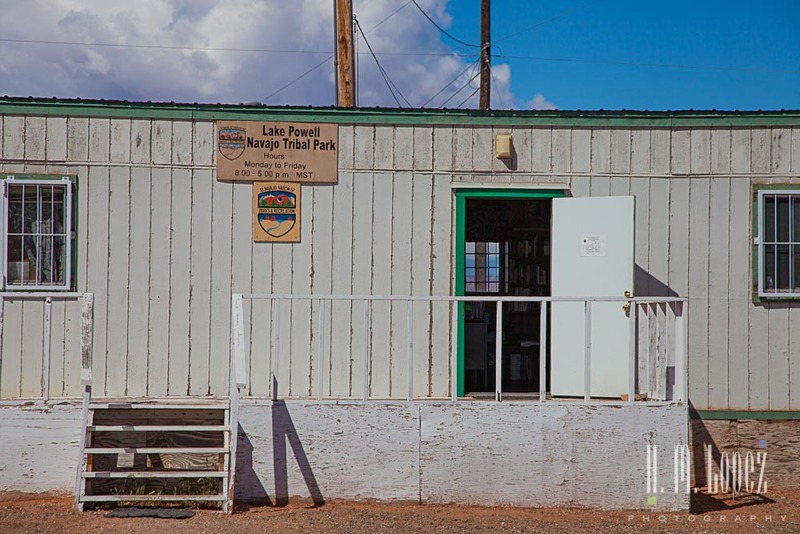 This entry was posted in Arizona, RV fulltimers, States Visited by islandgirlwalkabout. Bookmark the permalink. Good tips. Hope to get to use them sometime. There is lots more to do around there. The Four Corners area is beautiful. Just one word the photos in your previous post — magnificent, and your tips post is incredibly generous and very helpful. Thank you. 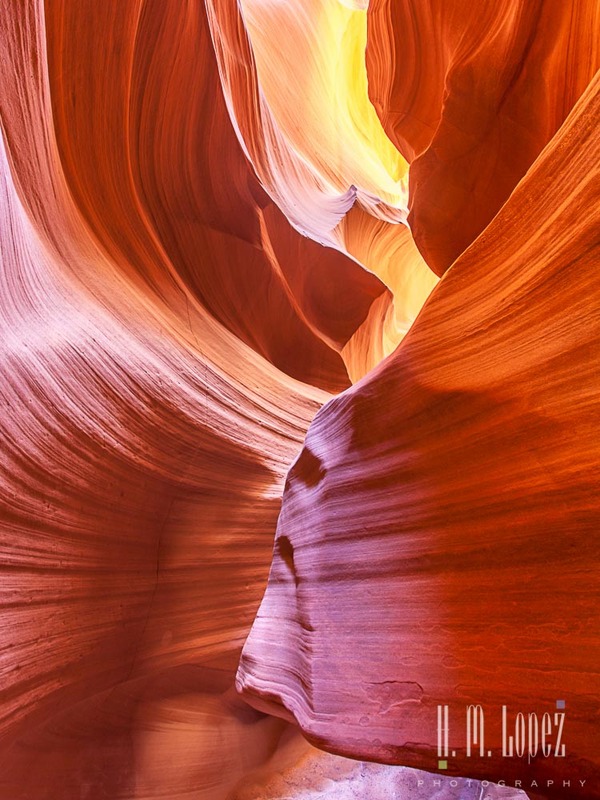 These are great tips, I will definitely refer to your blog when we visit the canyon again. Great, hope it is helpful. Absolutely stunning photos! You are soooooo good! Thanks, Linda. We made it to Albuquerque and Angel and I are nice and settled. Hector left this morning. Thanks for all the tips! We’ll keep this handy for when we make it there. You’re welcome! Hope it’s helpful. Excellent tips Hector. And that photography…oh my! Your work just keeps getting better and better. Thanks, LuAnn. I agree that Hector’s photography has evolved quite a bit in the last years. He works hard at it. I am sure you will still get some lovely photos, the guides provide opportunities for the regular groups as well, just not as many. 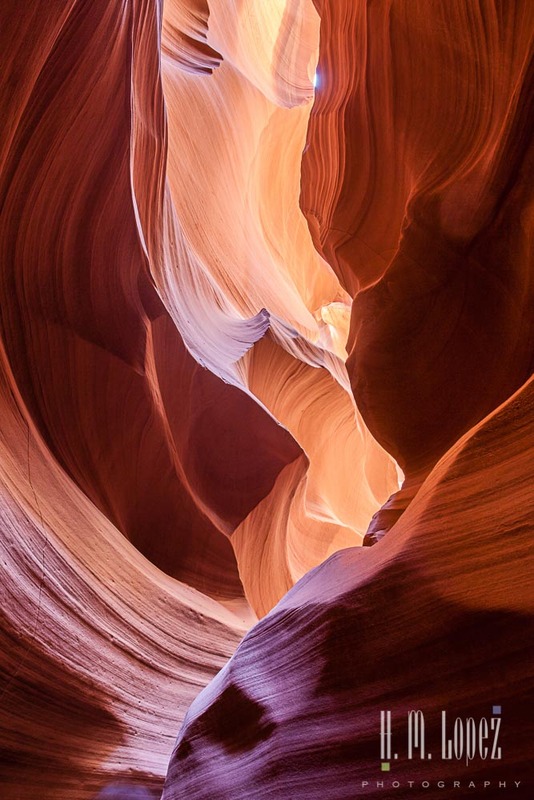 Although, you may want to check out the Adventurous “Photographers with Friends and Family” Tour of the Upper Canyon (#6 in their website), it is not at the peak sun time, but gives a little more time in the canyon, and allows but does not require SLRs. Great tips Hector. I would like to go back now that my photography has improved since I was there 4 years ago. I really didn’t know what I was doing back then. To receive new blog posts via e-mail, enter your e-mail address below and click the subscribe button.